Is that the face of such a wild child? It's a good thing she's so stinkin' cute, because she is out of control! That smile just looks like she's up to something. Today she told me she was "firsty to death". Heaven forbid! She did rock at her 1st "dance" class! It's really just tumbling, but whatever. She is adorable and probably makes you laugh so if you do get mad at her you can't stay mad! Get that girl a drink!!!!!!!!! She is so precious!!! I always love to hear what she has to say. I guess that is the preschool teacher in me. Love her smocked dress!! I always loved those for my girls. Have a great day. Love & blessings from NC! She is too precious--I find it very hard to believe that that cutie is ever B-A-D--lol! That face kills me. She is just too cute. Uh? 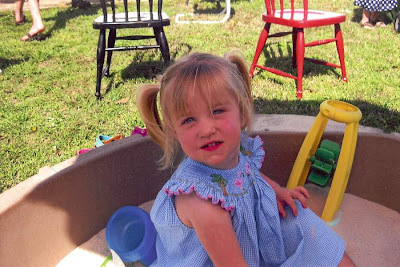 Is that a precious little girl wearing a smocked dress in the sandbox? Precious!! Love the dress.she is just too adorable! Firsty to death is TOO CUTE! !